Entry filed under: Advice for Job Seekers. Tags: interviewing. Skype Interview Tips … Welcome to the Future! Beating the Résumé-Elimination Game: Where Do Recruiters’ Eyes Go? What a fantastic article and so true! Thank you! This was a great article and very helpful for my next career discussion with a potential employer. #1, half wrong, being too early is not desperation in fact I’m often told to be 15 minutes early. You can’t control traffic and sometimes you arrive before you planned. I’ve tried hanging out in the car, walking around the grounds etc but in the end you still end up early especially if it’s Phoenix, and the summer and it’s 110F outstide. #16 Is really none of their business. Why let them lowball you if the job potentially pays more. One of the primary reasons people move on is pay so why risk it? If they’d be honest and give at least a range up front there’d be no need for the question. The financials could be safely saved for the actual job offer. BTW this also apples to #15. If I don’t know what the job pays and you don’t want to offer it up then any question of rate is off the table till a real offer comes up. Perhaps that’s as it should be if we’re all NOT just prostituting ourselves. #18 falls into the category of schmooze. Friendly and approachable is one thing but I’m really not interested in the birth of the manager’s upcoming child. Interviews are like night clubs, very superficial and usually full of lies. On second thought, perhaps it’s better to treat it like prostitution. You are certainly entitled to your opinions. All I can say is that we fundamentally disagree on pretty much all of the points you made. Hey … whatever works for you. While James’ response was a bit brusque, he actually brought up a number of very good points. Many people go into recruiting not because they want to help companies find the best candidates, but because they are lured by the incredibly good money you can make. In fact, to prove that point, I went for a job interview to be a recruiter. The first question out of the hiring manager’s mouth was not what were my qualifications but how much money did I want to make and how many calls can I make in an hour. Needless to say, I quickly learned that being a recruiter may not be the best career choice for me at least. The fact is that the principal difference between average recruiters and good ones is that average recruiters tend to forget the human element in the hiring equation, not from the hiring manager’s side, but from the side of the candidate. No candidate in their right mind would do most of those things listed above. If anything, the reason why most candidates don’t get jobs is because they simply were unable to connect with the interviewer in a meaningful way. Recruiters need to realize since they are usually the ones who share the bad news with their candidates that they will undoubtedly deal with a candidate now and then who is not just disappointed, but very frustrated. That is truly the time when you as a recruiter need to use you people skills to calm that person down because the person you just disappointed today may be your dream candidate tomorrow. Unfortunately, recruiters have been taught that people are disposable. As a candidate, I can safely say I am a person who wants to find a job, has the passion and drive to excel at a job if given a chance, but sometimes need that extra assurance that things will work out in the end. Maybe you should write an article about the 20 ways recruiters blow it with candidates. It may actually be very useful, not just for recruiters but for candidates as well. James’ comments were not just “brusque.” They were dripping in negativity and cynicism, and (in my opinion) were simply filled with bad advice for most job-seekers. He projects an attitude I’ve certainly seen before with candidates that I’ve found to be very difficult to work with … and are usually unlikely to succeed in interviews. While he is certainly entitled to his opinions (and I would never censor his right to express them — even in my blog! ), as a recruiter I would never choose to work with someone like that. On the other hand, I agree with almost everything you wrote in your comments, Tim. Recruiting is, essentially, a sales position. I’m not at all surprised by your recruiter job interview story. Many recruiting agencies are run by old-school sales managers who hire and assess their recruiters based on typical sales metrics: number of phone calls per day, number of minutes of “connect” time each day, number of new “send-outs” (interviews) per week, number of placements per month, revenue earned per quarter, etc. Those are the easily measured factors that are used to evaluate recruiters in the staffing industry. 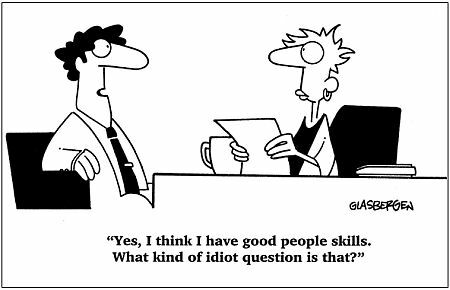 And yes, they totally ignore the “human” factor that separates average recruiters from good ones. Unfortunately, sometimes the recruiters who meet and exceed those metrics (and actually make the most money in our industry) are also not very nice people. Yes, there are recruiters out there who lie, cheat, deceive, bait & switch, promise things they cannot deliver, and will pretty much do or say anything to get a placement and get paid. I’ve met some of those people, and their sleaze factor can be quite astounding! Unfortunately, those bad recruiters tend to give the entire profession a negative reputation. How can you tell the difference? Just like with any other business relationship, time will reveal the traits of a person worth working with: honesty, integrity, sincerely, responsiveness, timely follow-through, etc. Good recruiters treat everyone with respect, and care about the people they work with. They try to do the right thing, and look out for everyone’s best interest – their own, their client’s and their candidate’s. Gosh Michael, and just where do you think that negativity and cynicism that’s apparently dripping all over your floor came from? Before you say “Troll” I’ll stop you short. It comes from 20 years of dealing with your industry which except for a handful of examples I found populated by glorified clerks. I’ve dealt with so many in your field that I know their pitch before they make it and know when they have a real relationship with a hiring manager or not. So I’ve become sensitive to any hint of ego from those in your profession. Most recruiters have no more status than a car salesman and deservedly so, their function is almost the same. Perhaps you’re different, Perhaps not. Maybe you’re the greatest recruiter in the country or maybe you’re just the most sensitive to your profession’s reputation. What I can tell you is that I’m not operating in a vacuum and much of your advice runs counter the the way the job market works. Perhaps if you’re placing attorneys and CPA’s that’s not the case. Then we have the reply from Tim Woods which was thoughtful but you chose to attack that too. Lighten up, it’s not about you, it’s about your reader. If you can’t tolerate a contrary position don’t publish to the Internet. Secondly, I can certainly tolerate contrary positions, as evidenced by the fact that I published both of your highly negative and cynical comments instead of simply deleting them. Although I do think that your resorting to name-calling (“glorified clerks” “car salesman”) does not exactly elevate your writings to the level of a professional critique worthy of serious consideration. And finally, I stand by the advice cataloged in my blog articles. I can’t imagine what job market you are living in, but the thousands of regular readers and overwhelmingly positive comments I receive every week make me think that my words are hitting home and actually helping lots of job-seekers in the real world that they are living in. I don’t claim to be the greatest or the most sensitive recruiter … I’m just a guy with some opinions. However, my 14 years of experience in the staffing industry has shown me that my ideas have merit to most people, and do actually produce positive results. And yes — I agree it’s not about me, but rather it’s about the readers I hope I’m helping.